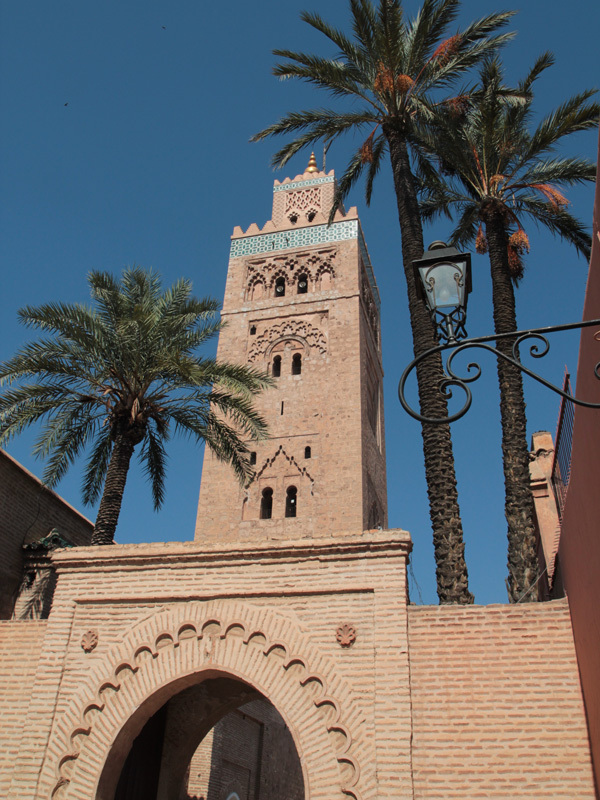 The landmark is watching in lofty style over the “Red City” – Koutoubia Mosque with its 77 meters high minaret can be seen from almost everywhere in the city and is one of the most photographed motifs of Marrakech. Koutoubia Mosque has been built in the middle of the 12th century on the foundation of the Almoravid palace Ksar el-Hajar. Like many other buildings in Marrakech, this palace had been torn down by the Almohads, the successive dynasty of rulers. Shortly after the mosque was finished, a grave mistake became evident: the mosque was not properly aligned with Mekka. Thus, it was leveled and rebuilt in 1157 and dedicated one year later. 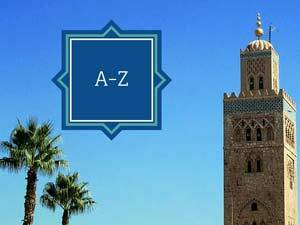 The construction of the minaret, which exists to this day, was finished not until 1199, about 40 years after the mosque. Made of rammed earth and coarsely hewed sandstone, the mosque can accommodate 25.000 Muslims on a ground area of 90 meters by 60 meters. The prayer room consists of a portico with 17 parallel naves and 7 transepts. The central nave alone has seven cupolas. On the top of the minaret, there are a spire with gilded copper balls (jamur) and a flagpole looking like a gibbet. This was used to hoist the green flag of the Prophet before the prayers on Fridays and religious holidays. The pulpit (minbar) is worth particular mention. 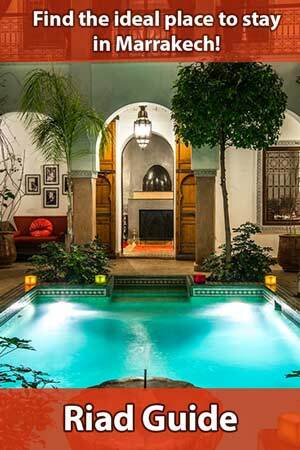 Crafted in the 12th century in Cordoba, it was in use until the 1960s. After extensive restoration, it was put on display in the Badi Palace. 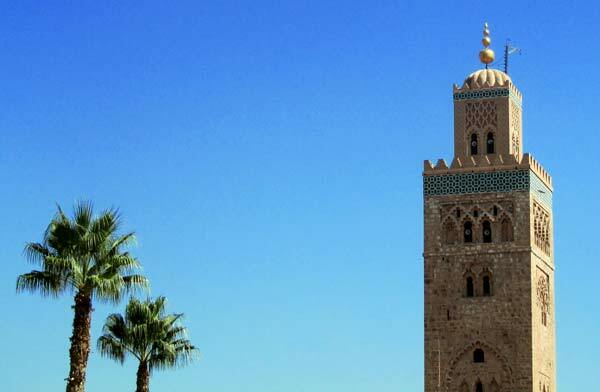 The minaret of Koutoubia Mosque soon became the architectural prototype for most minarets in the Maghreb as well as for the Hassan Tower in Rabat and the Giralda in Sevilla. 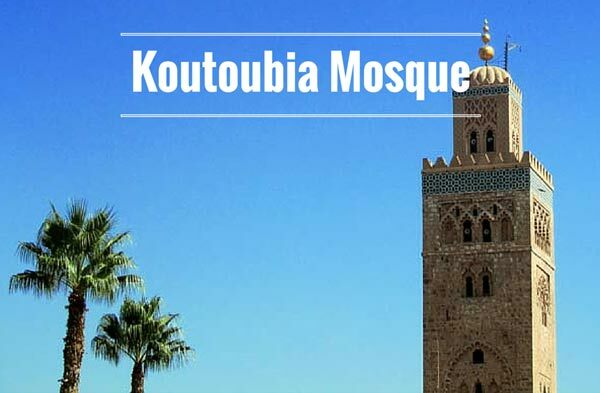 In 1997, Koutoubia Mosque was renovated. By the way: Its name was derived from the booksellers’ souq Kutub which used to be located in the immediate vicinity. Surrounded by a palm garden, the mosque is within eyeshot of Jamaa el Fna in the southeastern part of the Medina. Unfortunately, non-Muslims are not allowed to enter the sacred building! Admiring the biggest, most important mosque from outside is impressive enough though. Koutoubia Mosque is located to the southeast of the Medina, in walking distance from Jamaa el Fna. Like almost every other mosque in the world, it is out of bounds for non-Muslims. Nevertheless, one should not forgo a stroll around it.